Of the 351 cities and towns across Massachusetts, Lawrence ranks at or near the bottom on many quality of life indicators. Among the poorest cities in the Commonwealth, Lawrence is also home to the largest Latino population in New England, the majority of Dominican or Puerto Rican descent. Lawrence residents face a myriad of health challenges, from heart disease and tobacco-related illnesses in older people to too-often life-threatening asthma in children and adults alike. More than a third of the city’s children live in homes where families struggle to get by on incomes below the poverty level. Yet despite the health and economic challenges it faces — or, perhaps, because of them — Lawrence is in the midst of a hard-fought transformation on many fronts. Multiple, overlapping health and community development initiatives are sparking a much-needed revitalization in this gateway city. Indeed, in 2015, Lawrence was one of only eight communities across the United States to receive the highly competitive Robert Wood Johnson Foundation’s Culture of Health Award. 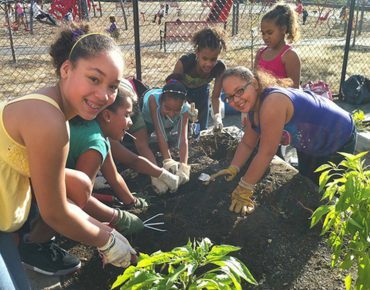 One of the key partners in the city’s ongoing transformation, Groundwork Lawrence (GWL) has been working to make the Greater Lawrence area a healthier, greener, safer place to live, work, and play. Since 1999, GWL has spearheaded multiple, connected initiatives to help local residents improve their health and quality of life. Increase Access to Healthy Food by developing and programming a citywide network of community, backyard, and schoolyard gardens; expanding access to community-supported agriculture (CSA); promoting and supporting food subsidy tools; and planning and managing Lawrence’s farmers markets, where prices for fresh food are often lower than at grocery and corner stores. GWL also offers healthy living programs that include cooking classes focused on integrating healthy foods into culturally appropriate meals. GWL’s fresh food access programs include education in an effort to reduce the city’s disproportionately high rates of obesity and diet-related diseases. Improve the Quality of Air, Water and Land through brownfield redevelopment, volunteer cleanups, tree planting, water quality monitoring, and integration of low-impact development techniques. Groundwork Lawrence’s open space and environmental projects, in particular, are re-visioning the city’s landscape and forming the building blocks of a healthy community. Focusing on vacant and often contaminated open spaces, GWL works with community members and partners to envision and design the open space improvements they would like to see. Groundwork Lawrence served as the catalyst and project manager for the Spicket River Greenway, a transformative 3.5-mile-long “emerald bracelet” of green spaces and walking paths. Connecting seven community parks built or rehabilitated by Groundwork Lawrence and its partners on formerly vacant or contaminated lands, the Greenway winds through some of Lawrence’s poorest neighborhoods, linking approximately 27,500 residents and seven schools. For over 15 years, thousands of residents, multiple nonprofit partners, the City of Lawrence, and numerous public agencies were involved in decision making, planning, fundraising, and troubleshooting to move the project forward. GWL coordinated community outreach, environmental investigation and remedial activities, site design and planning, legal and real estate transaction work, fundraising, project permitting, construction, and volunteer involvement to make this community dream a reality. The Greenway formalized and paved existing off-street dirt paths, making them safer and more accessible to young and old alike. Project developers also introduced additional walkways and safety measures along the Greenway, such as reducing widths of adjacent roads and increasing widths of sidewalks. 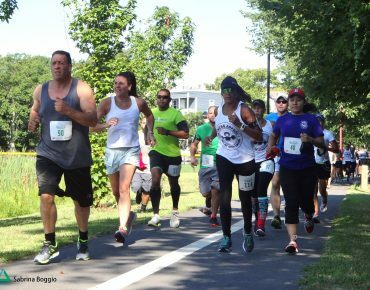 By increasing connectivity between some of Lawrence’s more distressed neighborhoods and enabling greater access to parks, waterways, and nature within the City’s built environment, the Greenway makes it easier for Lawrence residents to integrate walking, jogging, and exercise into their daily lives. By all accounts, the Lawrence’s Spicket River Greenway is a shining example of how a beautiful, community-designed open space can shape and contribute to a community’s culture of health.